A pediatric dental check-up is more important than many parents realize. It allows us to ensure that a child's teeth are coming in properly and allows us to clean their teeth to prevent the likelihood of developing decay. Even young toddlers can develop tooth decay. In fact, it is so common that there is a specific phrase for it, "baby bottle tooth decay." Baby bottle decay is when babies or toddlers develop tooth decay, also known as cavities. Very often, children suffer from this decay when they take a bottle to bed with them every night. Whether the bottle is full of milk or juice, drinking a bottle will place sugar on their teeth that will remain there throughout the night. While the sugar remains on the teeth, an acid may begin attacking the enamel on the teeth. If this happens night after night, it is highly likely that a child will suffer from decay. Children who breastfeed also have this risk since there is sugar in a mother's milk, as well. How do you prevent the bottle tooth decay? An efficient way to prevent this common problem is to brush a baby or toddler's teeth before they go to bed. Afterward, give them water in a bottle or no bottle at all. This keeps sugar off of their teeth while they are sleeping. Second, it is important to schedule a pediatric dental check-up at least twice a year. This will allow us to clean their teeth and remove some of the plaque that may have built up. 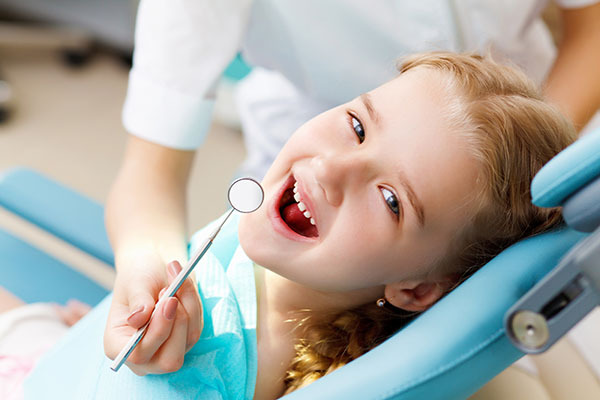 Why is a pediatric dental check-up so important? We want to prevent decay and infections whenever possible. However, we realize that sometimes a child may suffer from decay. In that case, these appointments will prevent future decay and also allow us to treat any current problems before they become worse. This is incredibly important because cavities and tooth infections can be very painful. We do not want any of our young patients to suffer unnecessarily. If they do suffer from decay that remains untreated, it could lead to premature tooth loss. This type of tooth loss can create a variety of challenges with the positioning of their teeth. Will my child be uncomfortable? We treat children on a regular basis and know how to keep them physically comfortable. We also work hard to help them feel welcome and safe when visiting our office. Parents can further help with this by talking to their child about what to expect from the appointment and being positive about the experience overall. Children take a lot of cues from their parents. Thus, the way in which a parent prepares for and handles the appointment is going to significantly impact how the child feels and behaves. One of the best things a parent can do for their child's oral health is to schedule an appointment with our office on a regular basis so that we can prevent and treat oral health problems. Call us today at (201) 620-9576.